Basically talks about Augmented reality tools now available to the masses, this example below was put together using Flash and Papervision 3D. Amazingly these tools are available for anyone to create similar augmented reality functionality. 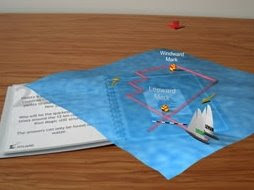 A great example here using the ARToolKit - 3dimensional book displaying augmented reality. No matter where the user positions themselves around the book, or how they turn it, three-dimensional images will still appear attached to each page. New virtual scenes and models can be seen by simply turning the pages of the book. The BlackMagic book contains an array of images ranging from a model of the original 1852 winner, America, to a virtual video depicting Team New Zealand's 1995 victory, and an animation of the 2003 America's Cup course. This is too sick for words - cant wait to see commercial applications being developed for this kind of technology. (btw one of the other ARToolKit examples was a furniture assembly manual in 3D, no more Ikea instruction manual 'translation' issues - see the demo examples in 3d right on your laptop). They are up for a FITC award too I believe. Really? a FITC award for the GE Windmill crap....hmmm wondering how much "award application" money was spent on winning an award for that crap AR implementation. It's a shame GE didn't actually implement something you know like worthwhile.